[SatNews] According to Euroconsult's newly released executive report, Government Space Programs: Strategic Outlook, Benchmarks & Forecasts, government funding for space is expected to progressively recover as public finances regain their comfort zone and programs enter a new growth cycle. Following a critical period of cyclical low funding which concluded in a budget decrease in 2013 worldwide, moderate growth is expected moving forward which should bring world spending to $82 billion by 2023. Although civil programs drive current funding, accounting for 61 percent of the world's total, defense programs are expected to experience a remarkable recovery while civil funding should plateau before entering a new expansion phase later in the decade. "Despite budget cuts, governments plan to launch 35% more satellites in the coming 10 years than what was launched during the previous decade," said Steve Bochinger, COO at Euroconsult and editor of the report. "Civil satellite missions will drive this growth with an average of 62 civil satellites launched per year, a growth of 55 percent compared to the previous decade, driven by Earth observation, communications and navigation programs. Defense satellites will remain stable with 210 satellites, of which more than half will come from the U.S."
Manned spaceflight is and will remain the first spending item globally but only from a limited number of countries. From $10.99 billion in 2013, investments are expected to grow to $17.5 billion in 2023 driven by the development of next-generation transportation systems and orbital infrastructures. Earth observation and meteorology received $10.7 billion in 2013 driven by civil programs to be undertaken in 62 countries by 2023, generating a huge 80 percent growth in satellites launches. The development of next-generation vehicles in multiple countries is boosting expenditures related to launcher programs: $8.6 billion spent by 15 countries/agencies in 2013. Satellite communications will continue its funding decline to an estimated $5.9 billion by 2023 under the effect of declining military expenditures. Civil programs drive funding and satellites to launch. Space science and exploration totaled $5.6 billion in 2013 and is expected to see a CAGR of 3.7 percent through 2023, driven by ambitious plans in Russia and Asia, and a sustained high level of investment in the U.S.
Satellite navigation reached $4.3 billion associated with only 6 programs worldwide. 124 satellites are scheduled for launch in the decade. Space security should continue to receive stable funding over the years ($2.7 billion in 2013); it should remain under the auspices of the top 10 leading space nations. While the top five space programs account for 93 percent of the world's government spending, the number of countries investing in space keeps increasing but is expected to stabilize. The average funding of emerging programs has increased significantly to around $50 million, however funding sustainability in these countries will be a crucial issue in the coming decade. "On the regional front, Asia is experiencing continuous high growth as governments altogether doubled their spending between 2004 and 2013," continued Bochinger. "The presence of three world leading space programs (Japan, China and India), new regional leaders (such as South Korea and Malaysia) and the emergence of new programs in the region brings strong dynamism which is expected to help Asia surpass Europe in the next years." Government Space Programs: Strategic Outlook, Benchmarks & Forecasts assesses from an economic perspective space programs undertaken by civil and defense government organizations worldwide. Key metrics such as public investment (funding) in space and government satellites to be launched are analyzed from different angles to provide a 360-degree view of government space programs. The report aims to provide a concise view of the economics of government space programs with 1) a strategic outlook containing global trends, forecasts and benchmarks by regions and applications and 2) a detailed application review of current and future trends globally and by regions. Euroconsult also publishes the report Profiles of Government Space Programs, which provides detailed individual profiles for the 80+ countries and agencies investing in space. Each profile contains the assessment of policies, budgets and program situations in all applications undertaken by the country or agency. 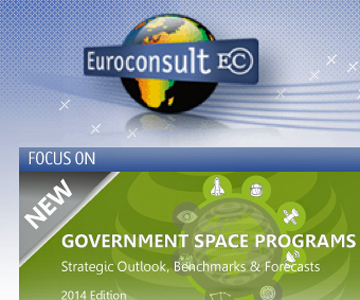 Euroconsult is a leading global consulting firm specializing in space markets. As a privately-owned, fully independent firm, the firm provides first-class strategic consulting, develops comprehensive research and organizes executive-level annual summits for the industry. With 30 years of experience, Euroconsult works with more than 570 clients in 50 countries. Euroconsult is headquartered in Paris, with offices in Montreal, Washington, D.C., and permanent representation in Japan. For further information regarding Euroconsult, please visit this infopage.